I am so happy to share with you this guest post from my friend Esra! I first started following her for her beautiful artwork and later travel journeys. 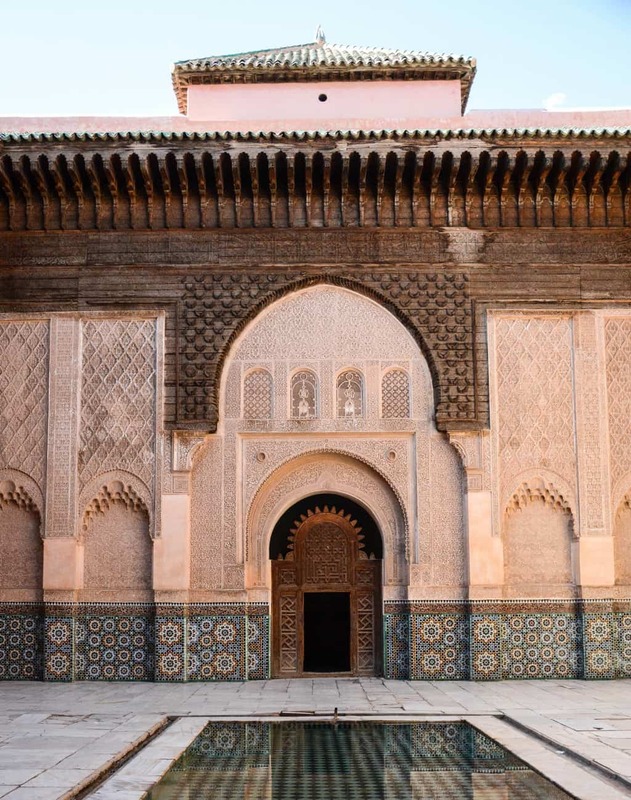 In this post she’s sharing some of the Islamic architectural highlights of Morocco that you can discover too when you visit. For more travel photos and information from Esra check out her website Arabian Wanderess, and if you want specific pattern obsessed photos then be sure to check her art account on Islamic Illumination. I hope you enjoy! Travelling was not my thing until I started doing my Master’s degree. I have lived abroad since I was 17, but I have always stayed within the city I moved to study in. During my Interior Architecture Masters, I decided to go where the research takes me and that launched my travel blog, Arabian Wanderess . 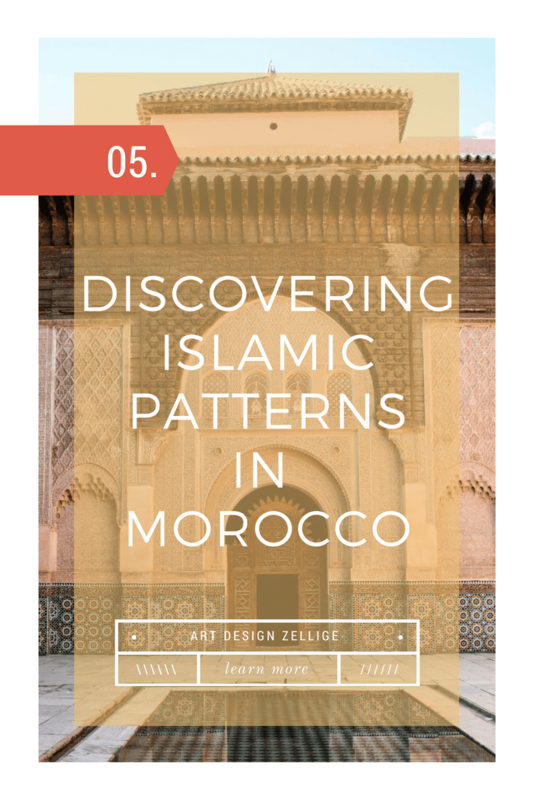 I first started out seeking Islamic geometric patterns. Patterns that I was only reading about. I knew going to see them in person was going to be crucial for me. I booked a trip on an impulse to Granada with the Art of Islamic Pattern to go marvel at the Alhambra. After seeing the wonders of the Moors in Spain, I decided to go right to the source and fly to Morocco to see where all the patterns started. 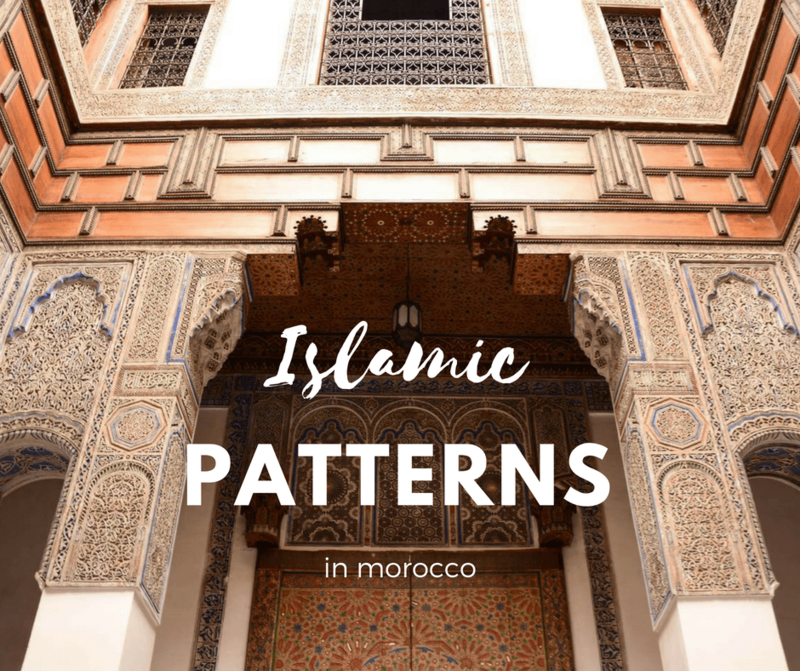 In this post, I am going to tell you all about the wonderful sights of Islamic patterns that I found in Marrakech and Fez. I started with Marrakech, because I knew two people whom were already going, so, I tagged along. I was not sure what to expect, so I thought going with two other girls would be safer. I quickly found out, that I blended right in with Moroccans with my Gulf Arabic features and my causal, practical clothes. Well, until I opened my mouth with my different Arabic accent or when I got my camera out. My main draw to the country was the patterns. That is why I decided to stay in the old town to be fully immersed in geometric and vegetal patterns. I stayed in a Riyad, an old style hotel, which means a garden in Arabic. The garden refers to the courtyard in the middle of the hotel that usually has a fountain/pool and trees/plants. It was a good start to my quest. The stunning geometric patterns extended to everything else too like the pottery, the doors, the walls and more. 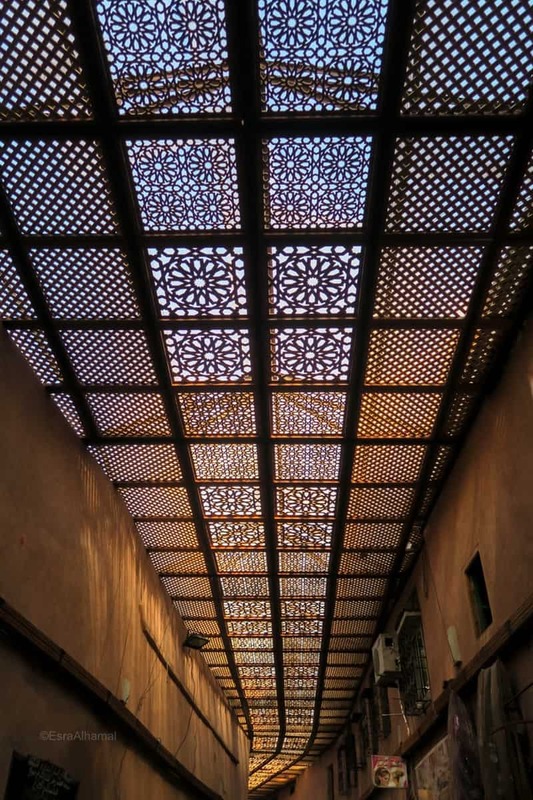 On my first trip to Marrakech in 2014, the souq/market had a normal wooden ceiling, but when I returned in 2017, I saw their new, wonderful geometric pattern paneled ceiling that made my heart sing! My main pattern quest was fulfilled with two architectural gems: Ben Youssef Madrasa and Bahia Palace. Both were stunning, although there are about five centuries between the two. Madrasa is the word for school in Arabic and schools were an important Islamic construct and it’s seen all over the Islamic world. The Ben Youssef mosque was built between 1557 and 1574 a hundred years on the remains of a previous one that was commissioned by Ben Youssef. The only remaining thing from the previous one is the name. I was very pleased going there not knowing how everything will look and as I walked in from the entrance, I only saw few simple patterns until I arrived to the courtyard and all the mesmerizing patterns were revealed. The student rooms were located on the upper floor. They are very small and give you an idea of the humble life of those students. I just did not want to leave. 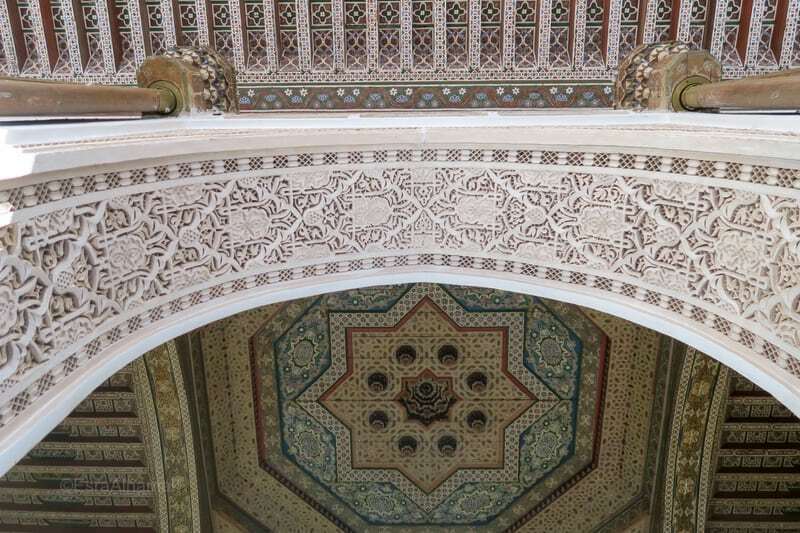 The Bahia Palace was built in the 19th century and although it is considered a young building in the life of Islamic architecture, it is beautifully designed and adorned by patterns. The first time I went, I went with my friends and I just wondered off not knowing much of the story. In fact, I was not curious about who lived there and their lives. All I wanted to see and understand was the geometry, the color combinations and the aesthetic. On my second visit last year, I opted for a guided tour thinking it will give me more insight. Sadly, all I got were stories of “concubines” and misinformation about patterns. I just left the guide in the middle of the tour and dived in the details that surrounded me. I had to look up to see the wooden painted ceilings, look down at the bright tiled floors and around me at the zelije tiled walls. Again I did not want to leave. The place gets extremely busy and I had to wait a full half an hour to get a courtyard photo! Marrakech was only the tip of the iceberg. I headed next to the craft capital of Morocco, Fez to dive in to even older architectural germs. I managed to see: Al-Attarine Madrasa (1325), Bou Inania Madrasa (1357) and Cherratin Madrasa (17th century). The first two Madrasas were built during the Marinid dynasty. Most surviving Islamic architectural sights are accredited to that dynasty and it is a show of wealth and power. The three have similar style and colors, but each one is worth a visit for their special characteristics. The Attarine Madrasa is the oldest one I visited and the name comes from the makers of perfumes because this is where the school is located, in the perfume-makers neighborhood. 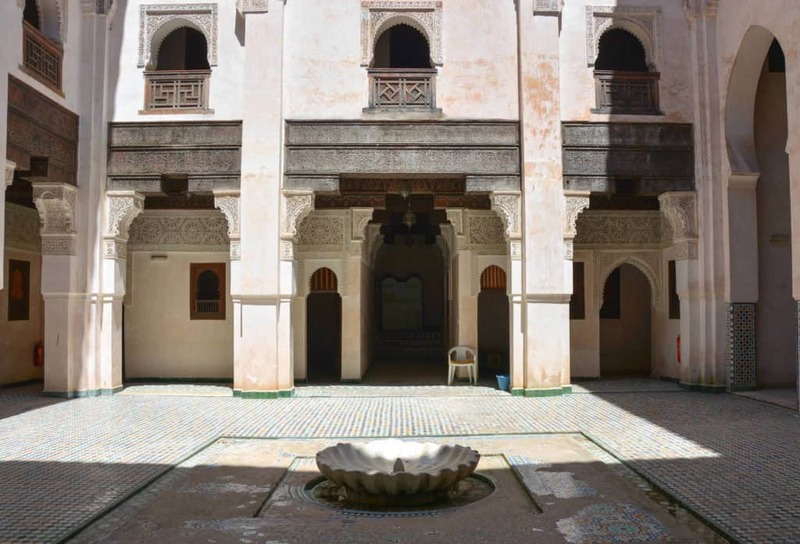 The courtyard is the star of the building and it has layers of details from the zleije tiles to the Arabic calligraphy. 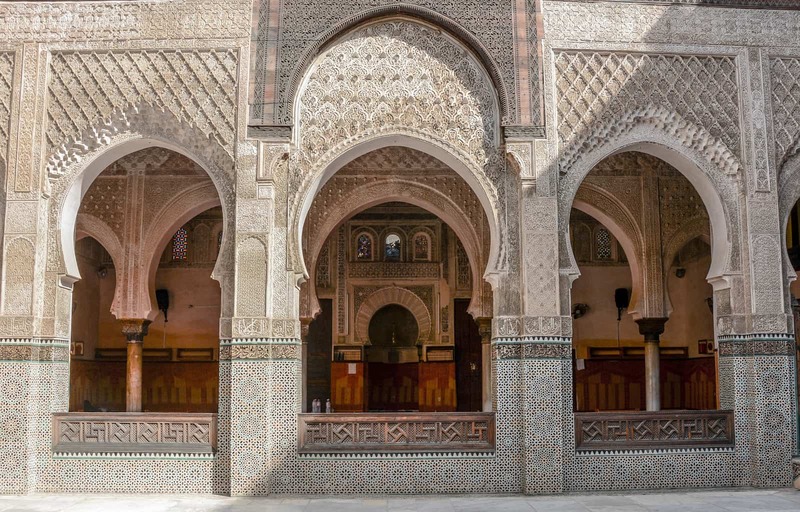 The students’ rooms are simple and similar to the Ben Youssef Madrasa. It must have been the standard for those three centuries. . Although built only fifty years later, but Bou Inania Madrasa has a special feature that does not usually appear in schools, which is the minaret, making it a mosque and a school. It is still in use and people still pray there. This additional mosque feature makes the courtyard design very interesting and the two purposes are reflected with the split courtyard. The last school I visited was Cherratin Madrasa and it is one of the lesser known ones or that is what it felt like at least because it is the one no one seem to remember or know. 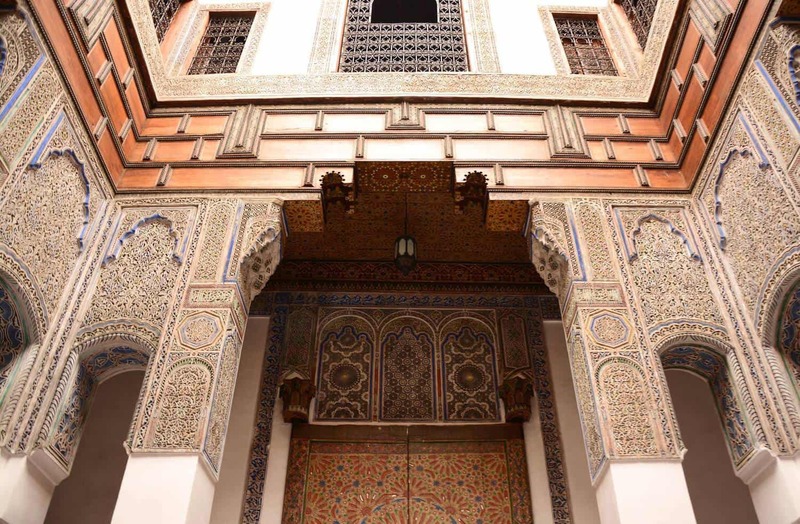 It was the biggest one in Fez because it fitted 150 students in it and although it includes carved stucco patterns and some colourful tiles, it is the one with the least amount of patterns. Going into the courtyard to the half bare walls made me feel like it was not finished like the others, but I found the structure and the small amount of patterns to still be interesting. 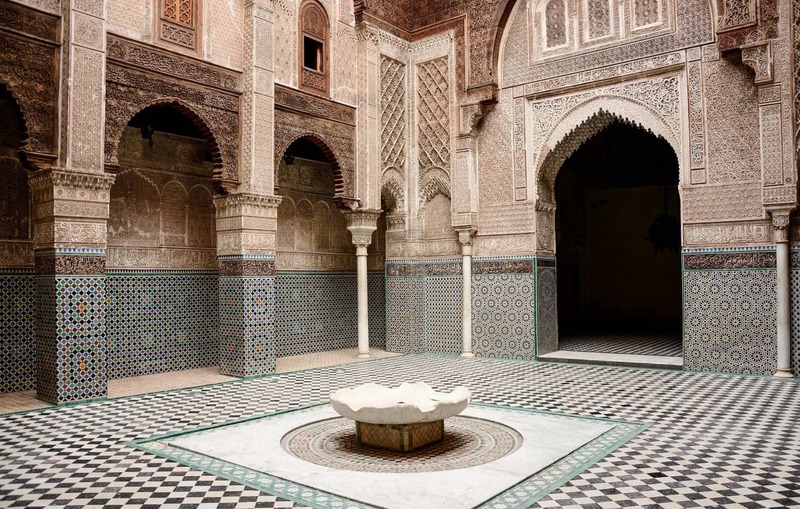 Morocco has a wealth of Islamic architecture and Islamic patterns that are worth a visit. Thankfully, the main architectural gems are well reserved and are easily accessible. 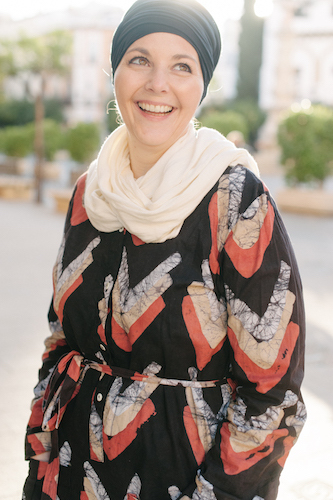 Author Bio: Esra Alhamal is a Saudi travel blogger based in London. 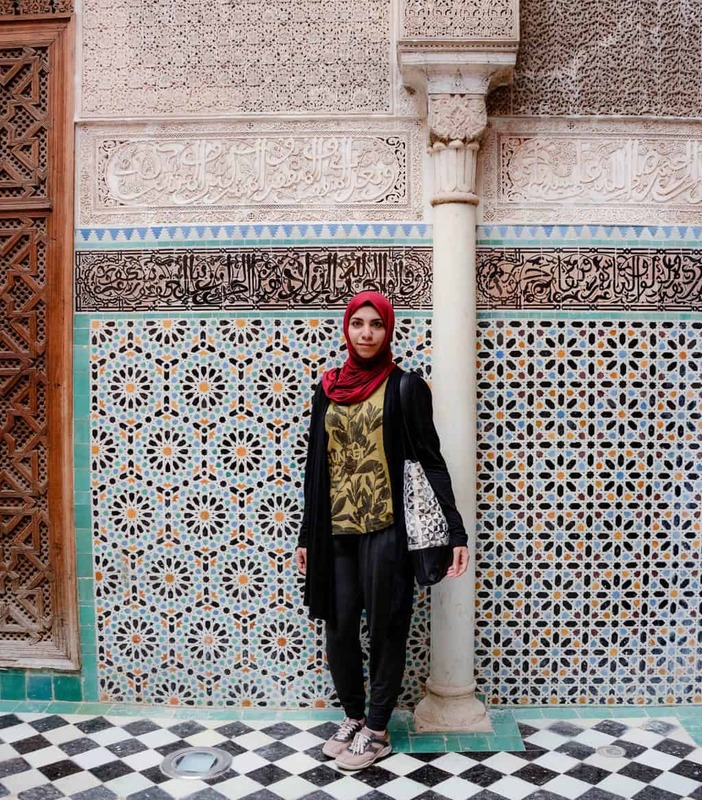 She shares her travel experiences as an Arab Muslim woman travelling solo or with friends on www.arabianwanderess.com. She also documents her trips on YouTube www.youtube.com/arabianwanderess. Esra focuses on Muslim female friendly destinations worldwide. Her travel interests are architectural heritage and outdoor activities.